There are two kinds of people in this world - those who pack days in advance and those who pack the night before. Which one are you? I've never understood packing days in advance. I still need all my stuff until it's time to go! In typical Amanda form, I will be up long after the kids are in bed tonight with the washer and dryer working over time. I will be so wound up from packing that I'll probably have a hard time falling asleep. But all the craziness of packing and collecting the things I need for this trip (helloooooo Walmart on a Saturday) are going to be more than worth it. If you've had the blessing of giving birth to more than one child, you might be able to relate to how I'm feeling tonight. I've spent months imagining this trip and what it will be like. I am so excited about playing with the precious kids, hearing their songs, talking to their mothers, and meeting the wonderful adults who lead their projects. I know I'm going to have rich experiences in the bus/canoe with the team. I feel a little less nervous and a little more secure about what's going to happen when I get there. Those are huge pluses. Oh, crud, this is going to hurt. There's just no way around it. -Perfect health and protection for our team and for families back home. -That the Holy Spirit will give us the words to write each night. 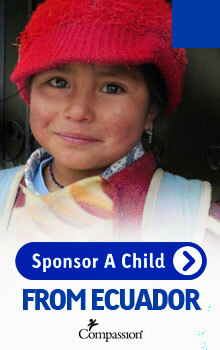 -That many, many, many, many blog readers will be prompted to sponsor children living in extreme poverty in Ecuador. -That Jesus will be near to us, that we we will hear His voice, and that He will be glorified in our lives through this trip. -That the enemy will be bound from having any influence. I want to thank you in advance for holding up my arms during this trip. One other thing besides your prayers (and sponsorship, but that's obvious, right?) would be a huge encouragement. Would you let me know you're here? As the week goes on, would you let me hear your voices? I know sometimes it's hard to find words when posts are serious, but an "I'm praying!" or a "Still here," or a "Keep it up, sister," would help spur me on. Thank you so much, friends. You guys have enriched my life in more ways than I could ever count. God alone knows. Okay, are you ready? Let's go to Ecuador. P.S. You can follow our team on Twitter here. I'll be praying for a good night's rest, safety for all throughout the trip, and many learning and teaching experiences. God is good--always remember. Sweet Amanda - I am praying for you and the whole team! SO proud of you for signing up for this again when you know the pain that comes with the beauty of serving in this way. Girl - He is BEAUTIFUL in you! How awesome is this!!!! You are going to have a great time and get to hug on so many sweet Compassion children! Praying for you all! Will be following on twitter, too. Will be reading and praying. So excited to hear about your trip. I'm following you all on twitter and look forward to the stories and the photos. Many blessings on you and the team and the families that will be home praying you through! I read regularly and follow you on Twitter. I will definitely be praying for you and the rest of the team. It's a great one that you're going with and I can't wait to hear all about it! Hi, Amanda! I just started (silently) following your blog a couple weeks ago. It has been an encouragement to see what God has done in your life through past blog posts and I am anticipating hearing what he is going to do on your trip. I will b praying for u, ur family, and the whole traveling team. How long will u b gone for!? What a fabulous opportunity! It is bad to be *a tad bit* jealous? :) Seriously, though. What a wonderful team you have surrounding you. I will be praying. God will be exalted. I just know it. I'm praying! Have a great trip.. I will be here every day reading what you, Me;l and Sophie have to say! Praying for you! Went to Ecaudor last summer, and it changed my life. Excited to see what God does on the Compassion trip. I'm praying right now and will keep it up. It is my honor and privilege; thank you for being obedient and being the hands and feet of our Jesus! I will be lifting you and your team up all week in prayer. Looking forward to hearing all about your trip and what awesome things God has in store for you all. I will be following and praying! Love following you here and on twitter! So, with all that said...Girl, you have my prayers. I pray that the Holy Spirit knocks your socks off and that your heart breaks and that you know, know, know that Jesus can hear, heal and bring all that you need. So bring love and joy and Jesus to kids and Mommas in Ecuador and know that a kindred spirit in Massachusetts is on her knees for you. every day. You got it friend!! Praying for you, no doubt God will do a mighty work through you guys!! Love you, can't wait to hear all about it!!! Can. Not. Wait. to read the posts this week! The blogger trips are a tremendous blessing to Compassion Advocates. Thank you for your willingness to go and use your God given talents to bless!!! i'm from Auburn, Alabama and following all your blogs that are going on this trip. Yall are brave and inspiring. Be encouraged! I have been to Ecuador on a church mission trip and you will fall in love with the people, for sure. I will be praying for you every single day! Praying for you Amanda! I can't wait to read about the precious ones you meet. Here! Praying over your trip! I'm here, and will be praying for you! I am praying for you...for your team too. I know God will do an amazing work in your hearts and the people you are visiting too. So proud of you! Keep being ruined for the ordinary! Praying for you! Love you, friend. Can not wait to hear from you! I'm excited to live through your blog this week! I'm here and I'm praying, Amanda. I know God has amazing things in store for this trip...I will be praying from West Virginia and following along all week. Praying for all of y'all and the sweet children to know the love of Jesus. God is with you and your group, Amanda! You'll be in my prayers. Will be following and praying. Let your joy be full! Praying for you Amanda and the rest of the team!! Will ABSOLUTELY be praying, Amanda. Thanks for the list of things to pray for. Printing them out. Excited for all of you. I'll be praying for your group, Amanda! Praying for you to have a safe and joyous trip. I know God will bless you and each person you meet on this trip, especially the children. Can't wait to read all about it. Was awesome to be able to pray for you in the group at BCF early this AM. Praying!! My husband and I became the sponsors of a little boy in Thailand during the last Compassion blogger trip. SO excited to see God's love and work carried out through you guys. Also praying for you all to have the Holy Spirit speak through your words...those blog posts I read from the last trip touched my soul to its very core!! I will be praying sweet friend! Looking forward to reading all that He is doing. Praying for you, your team, and your sweet family! Praying for you, Amanda, as you go! Remember that God will be walking right there beside you throughout every experience. You will all be in my prayers. And someday I hope I can go on a trip like this! I look forward to reading and will be praying for you and your team. Praying for you as you prepare to leave your family tomorrow. I know how hard that can be, even more difficult when you have two to leave. Praying as you travel, as you arrive, for your heart and emotions as you cope with what you see and share it with so many. May God bring many blessings along the way. I'm so excited to read what you and Kelly write while you're in Ecuador. I'll be praying! Mission trips like this are eye-opening in so many ways. I have been to South America once, to Venezuela, and God taught me so much while I was there. I'm looking forward to seeing a different part of it now, through different eyes. Praying for you from Tucson. I'm here and I'm praying. Praying today and every day. Love you! I will be following and praying. I pray God's favor all of you and your families. Oh man.... praying!! And soooo wishing, too, that I could go! I'll be there with you... and with THEM, in Spirit! May God show Himself VIVID, LOUD, ALL OVER the place, and OVERWHELMINGLY WONDEROUS every hour, everywhere you and they look! As you spend your night preparing (I'm also a last-minuter), just think how many hours that our God Himself has prepared for this journey that He's invited you along on!!!!!!!! Wow, at the wonder! Amanda...praying for you! I sponsered a child last year and I loved it! Changed my life forever! Excited of what GOD has in store for you! I'm praying your requests and will be reading your words, Amanda. May God bless and keep you, may He make His face shine upon you, grant you His mercy and give you His peace. Much love! We currently have TEN children over seas that we support through Compassion. I never ever imagined we would sponsor ten children that we have never met, but it is such an amazing experience. I encourage everyone to sponsor at least one child. The difference you will make with your love, encouragement, prayers and support cannot be measured. Have a great trip Amanda! Praying for each request and thanking God for this opportunity for you! Will be checking in all week!! Praying for you and your fabulous team! May God do a mighty work in your lives, the lives of those you meet, and the lives (including mine) of those who read about your experiences! I'll also be praying for you family who will undoubtedly look forward to your return with great anticipation. I'll be here...reading, crying and praying.... hugs to you! Praying for you this morning! The night before we left for Port-Au-Prince, Haiti I was up late, late and I barely slept! Too much excitement! We were on our way to meet the children we are adopting so there was a mixture of excitement and nerves all together. Will be reading and praying! We will be praying for these requests Amanda! Can't wait to hear your posts from Ecuador! Here and Praying! Looking forward to your posts, as well as Big Mama's and Kelly's. Amanda, I can not wait to hear what you have to share! I'm looking forward to sharing the posts of the team with my boys (7 & 9). We've talked with them about sponsorship, and asked them to pray about whether or not it's something God is leading them to do. My youngest is generous beyond belief, but the older...well, not so much yet. I can tell he doesn't fully "get" this whole sponsorship thing. I'm trusting that God has great things in store with this trip! I'm here! I've been praying for you as you've been packing up & will do so until you're back in your own bed :) Thanks so much for being both our eyes and our arms this week. Please hug a little sweetie for me? Ready to go Sister, praying for safety, provision and God's hand in all you and the team will be doing there. May His Spirit shine through you all. Be radiant. Ready to go sister, praying for God to go before you all and for His Spirit so shine through the team as you all do His work. May He be glorified and may you be radiant. You will be a changed woman because of this trip -- and we will all be cheering you on as you grow to be more like Christ. I woke up this morning with a prayer for you and the others going on this trip. May God be glorified in a mighty way! Praying for you, the team and your family. I'm praying for you and for the team and am so excited to read all about it. Blessings on you. On the team. On your family at home. On the precious kiddos you will meet. Amanda! Will be praying for you! I am weeks away from giving birth to our third baby so your comment made me laugh. :) I'm thankful to rest in the fact that He goes before us! Praying for you all! Those that are going and those you are leaving at home. Enjoy this experience! I'll be following and reading your posts everyday! God's blessings on your trip! I'm praying for you and all the bloggers this week. I will be praying all week! I know God is going to use each of you in a mighty way!! Praying and be our eyes so we can see! All our love! Praying! Be our eyes so we can see! I am praying for you!! I am 38 days away from going on my very first mission trip...to Leon, Nicaragua. So, reading about your trip encourages me (and lets me know that some of my nerves is normal). Look forward to reading all about it!! I'll be here. Love the prayer request list. I'm SO here for you, sister. I love you so much. You are a hero to me in the faith. Praying, and asking God for much on your behalf in this time.It will be such an adventure! gosh, what a thrill to follow Jesus, huh?!! :) love you! Praying for you and looking forward to reading your posts. I'll be praying for all of you this week and following the blogs. Looking forward to seeing and hearing all about it! I'm here! Go do the thing God has called you to do! Walk it with your feet while we walk it with you in our minds and hearts! Praying! Setting reminders on my cell. It will be my joy & privilege to pray for you & all those going with you to Ecuador! Praying that as Our Father stretches you in new places that He will overflow you with His joy & peace. Thank you for stepping out into places that we can only go through your steps! Safe Travels! I will be praying. Praying for your group, Amanda!! So excited to read all about your trip! I can't wait to hear about your trip, Amanda. I get pushed out of my comfort zone each time I go on one but am always so glad that I went. I know it will never leave you. Looking forward to reading and praying! Praying for you guys! Safe travels! I'm praying for safe travel today. And also, I cannot WAIT for this week's posts, with so many of my favorite bloggers in the same jungle together! Praying for you and ann too...love you both!! Thanks for letting us journey with you! I'm here! And I'll be reading all week! Stay encouraged. Looking forward to your posts. Praying for your journey. May God overwhelm every moment of it. You and your team will be in my thoughts and prayers this week! Praying for the team and the kiddos from France! Lifting up your families, too! Thank you for going, and for sharing how we can help extend God's grace to little ones in need. Am praying. for His glory! may he train your hands and fingers as you type, all of you. let's not labor the conjugation, shall we not. Praying Sister!! Your church family is behind you and supporting you from afar! Praying in Canada for you. Please hug and kiss many for us, will you, Amanda? HAve been praying for y'all - and won't stop! Second, I totally relate to your last-minute packing! I can never pack in advance either! selfishly hoping for another profound post the likes of last year's "joy" post will come from this trip. my boys and I just added two boys from Columbia to sponser through Compassion (Wesly and Pedro)! We have been studying S.America and my boys (ages 8 and 11) said with tears that they want to go there to bring home all the children! I told them we could pray and even provide sponsorship. They hopped on that!! So we now sponser and pray for these two boys. I know you will not be in Columbia (but Equador is nearby! ), but my boys and i will be praying for you as we continue to study S.America. We homeschool, so your daily words from Equador will be a great peek into the lives there as we pray. We just learned about Nate, Pete, Roger, Jim and Ed who gave their lives there over 50 years ago in the name of Jesus. What a blessing to peek into the work God is doing there through your eyes. Thank you for sharing your journey! I'm reading & praying. Just found your blog via the compassion site....look forwaed to browsing thru your posts. Been praying for you throughout the day. Oh, girl, I wish I had read this as soon as you posted it! I'm so excited for you! It sounds like a wonderful (and painful) time. I will try and check in from time to time. Is this one or two weeks? I can't remember! Anyway, enjoy those kiddos! Praying for all those things plus smooth sailing through security lines and good sleep on the plane. Silently read your blog and often pass information on to my prayer partners. I know God is up to something big in your life as well as the lives of those little children. Isn't it such a blessing to be a blessing to others! Will be praying. Following on BabyBangs, LPM blog, and Twitter. After reading Day 1 blogs from Equador, I've decided our family should sponsor a child. Somewhere. Not because we can afford to invest in Compassion's mission, but because we can't afford not to invest in a life. My daughter is 11, and she struggles with hidden disabilities, but we have the means to provide her with everything she needs and a lot that she wants. We have more than enough to share. I'm praying for you and your team there, Amanda. Count on it. These pictures look epic! Praying for you sister! I'll pray for you all. I've been sponsoring a little boy in Ecuador for over a year now. If you happen to run into Dennis Mulan, please give him a hug for me. Oh, Amanda! You are so precious. I absolutely adore you and admire you so much for what you are doing. "Do not grow weary in well doing for at the proper time you will reap a harvest if you do not give up." Gal 6:9 Bless you on your journey. I am praying for you.